Quick overview Gives you an understanding of the ways in which modern art differs from realistic works of earlier centuries. This book examines 100 works of modern art that have attracted critical and public hostility from Cy Twomblys scribbled "Olympia", Jean-Michel Basquiats crude but spontaneous "LNAPRK", and more. 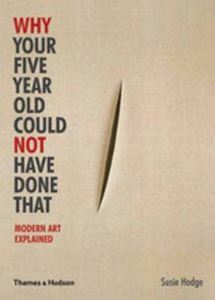 "Why Your 5 Year Old Could Not Have Done That" is Susie Hodges passionate and persuasive argument against the most common disparaging remark levelled at modern art. In this enjoyable and thought-provoking book, she examines 100 works of modern art that have attracted critical and public hostility from Cy Twomblys scribbled "Olympia" (1957), Jean-Michel Basquiats crude but spontaneous "LNAPRK" (1982), to the apparently careless mess of Tracey Emins "My Bed" (1998) and explains how, far from being negligible novelties, they are inspired and logical extensions of the ideas of their time. She explains how such notorious works as Carl Andres Equivalent VIII (1966) the infamous bricks occupy unique niches in the history of ideas, both showing influences of past artists and themselves influencing subsequent artists. With illustrations of works from Hans Arp to Adolf Wolfli, Hodge places each work in its cultural context to present an unforgettable vision of modern art. This book will give you an understanding of the ways in which modern art differs from the realistic works of earlier centuries, transforming as well as informing your gallery visits for years to come.